Throughout the history of most older houses repairs are made to the floors. This could be due to termite or dry rot damage or in an effort to bolster a sagging or squeaking floor. These repairs are invariable done with plywood, which can cause some serious problems because floor repairs can severely compromise the floor’s ability to transfer earthquake forces outward to the foundations. Below is a diagram of what a sub-floor looks like wherever it has not been repaired with plywood (a sub-floor is the floor below your oak or carpeted floor you walk on) . In this diagram you can see where a segment of the original sub-floor was replaced with plywood. When this was done the nails were removed from Joist E. and the old sub-floor to the right of the joist was removed and replaced with new plywood. Now you may have two independent floors: the original sub-floor and the new plywood sub-floor. The purpose of shear blocking to is make these two floors perform as one floor again and regain their ability to transfer earthquake forces to the foundation. Shear Block A connects the original sub-floor to Joist E.
Shear Block B connects Joist E to new plywood sub-floor. At this point the original sub-floor and the plywood sub-floor are jointed together through the common joist connection. 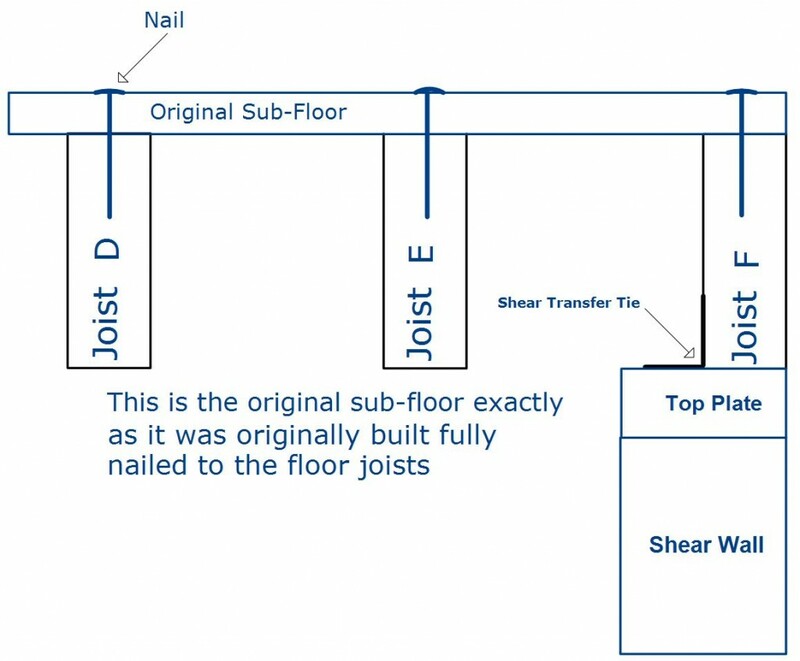 Shear Block C connects plywood sub-floor to Joist F. Joist F is connected to the shear transfer tie component of a shear wall such that now the floor will transfer forces to the shear walls on the foundation perimeter. Make sure the adhesive you use meets American Society for Testing and Material D3498 (this is a designation that means it has been tested for good adhesion to floors) and/or AFG-01, a performance specification developed by the American Plywood Association. 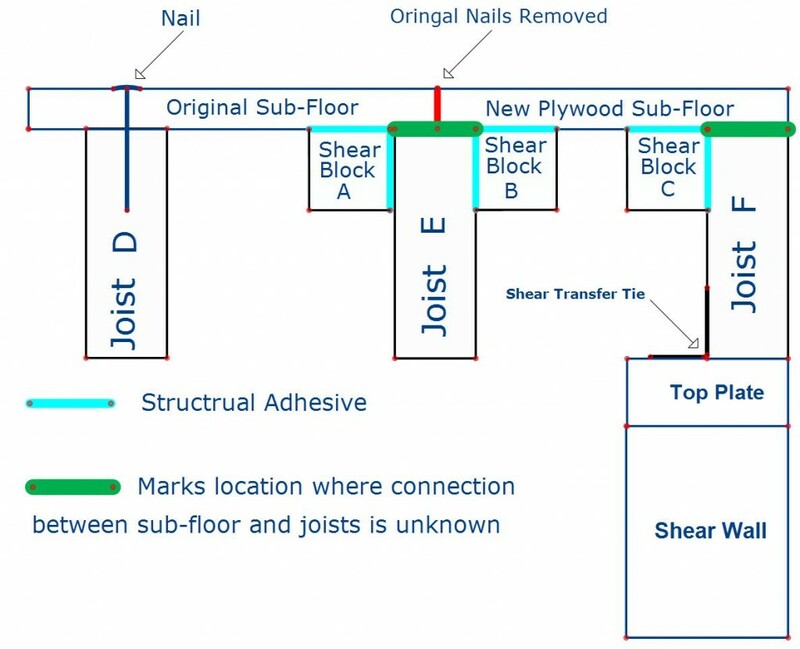 Shear blocks made with structural adhesive create such a strong bond between the joist and the floor that that they become in essence one solid piece, making the separation of the floor joist from the floor very unlikely. The 450-pounds-per-square-inch shear strength value listed below for a 1 cubic inch wood to wood structural adhesive connection is an ultimate shear value. In engineering lingo, ultimate shear value is the amount of shear force needed to cause a connection to fail. This is opposed to allowed shear value, which is what the building code allows you to use in retrofit designs, and as a rule is one-third of the ultimate value. In this case we must reduce the 450 pounds shear strength per square inch to only 150 pounds per square inch. Still, this translates into a shear value of 1800 pounds per linear foot. If we increase the amount of adhesive that contacts the floor and the shear blocking from 1 inch to 1 1/2 inches (this is what happens when you use 2 by shear blocking that is 1 1/2 inches wide) the shear value of these blocks increases to 2700 pounds per linear foot. Here is an example of how this relates to the components of a 10 foot long retrofit shear wall that will be absorbing the forces transferred through the floor. 10 linear feet sub-floor to joist connection will resist resist 18,000 pounds of force, which is a lot more than you need. The Engineer’s ways to Achieve this end. 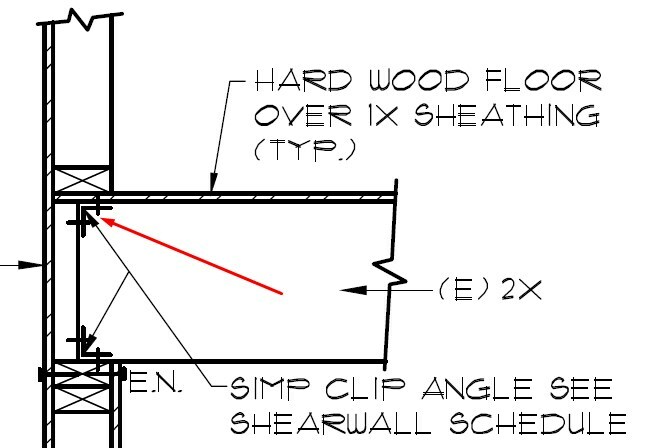 In the engineered construction detail below, the red arrow points at what is sometimes called an A35 Simpson Clip that attaches the end joist to the floor. In this installation screws no longer than an inch in length are used to attach the top of the A35 to the sub-floor. This is an extremely difficult connection to make from a practical point of view, and it is also quite weak. A better way to do it is with shear blocking which installs very quickly and is 10 times stronger. Not only is this hardware difficult to install, but it also has questionable value according to the manufacturer because it has never been tested. Nor does it have any value when analyzed from an engineering point of view using the connection calculator from the American Wood Council.